We will begin with a brief summary of the first 100 years of our congregation. When St. Paul's celebrated it's 100th anniversary in 1980, a detailed history was published in the centennial booklet. This account then will focus primarily on events from 1980 to the present. While meetings to establish a Lutheran congregation in the Plymouth area were being held as early as 1879, it apprears that the officail organizational meeting was held on August 30, 1880. At that meeting it was decided to purchase five acres of land from School District 43 to be used for building a church and establishing a cemetery. The newly-elected trustees, Peter Gerhard, John A. Weichel, and Christian Jarchow, completed this transaction on December 24, 1880, at a cots of $50. The property was one mile west of our present church where the former parsonage and our cemetery are still located. The congregation issued its first Call for a pastor to Pastor Henry Klokemeyer, who was already serving a Lutheran congregation in DeWitt, on September 20, 1880. He served until early 1882, and then a Call was extended to Pastor Traugott Haessler who was serving a Lutheran church northwest of Beatrice. Until this time services had been conducted in various schools and homes, but now a resolution was passed instructing John Stroh to present a plan for a church building. The plan for the new church was unanimously accepted on May 1, 1882. It would be 40 feet long by 26 feet wide, and 16 feet high in the interior, and it would be located two rods from the north property line and four rods from the west property line. During the annual meeting of 1887 it was decided to call the first resident pastor at an annual salary of $400 plus housing and the use of the church property for grazing his cow and horses. Pastor J. R. L. Lange accepted that Call on March 2,1887. The congregation purchased additional land from the school district which would be the site for the first parsonage. Pastor Lange served our congregation until May 1889. In filling the vacancy there was a great deal of discussion as to which synod should be requested to supply a pastor. The Iowa, Missouri, and Wisconsin synods were all considered, until finally the majority chose the Wisconsin Synod from which to request a pastor. Pastor Ernst Strube began his pastorate at our congregation in the latter part of 1889. On July 12,1903, Pastor Strube was granted a peaceful release from his Call, because he was retiring from the ministry. The congregation then extended a Call to Pastor Max Lehninger from Gresham, Nebraska. The Lord led him to accept, and he began his long ministry at our congregation on November 15, 1903. In 1904 the old parsonage was removed, and a new home was built for the pastor on the same site. On July 2, 1910, the congregation voted unanimously to join the Wisconsin Synod. On May 20, 1913, the church building which had served our congregation for over 30 years was struck by lightning and totally destroyed by fire. On September 7 it was decided to rebuild on the northwest edge of Plymouth on a two-acre tract of land donated by Otto Knoche. The cornerstone was laid on October 12, and the church was dedicated on April 16, 1914. According to Charlie Koenig, the church treasurer, the total cost of construction was $12,602.72. Pastor Lehninger served as president of the Nebraska District from 1917-1922. On November 10, 1929, the voting members granted him a peaceful release so that he might accept the Call he had received to serve as professor at Wisconsin Lutheran Seminary in Thiensville, Wisconsin. Pastor Walter Baumann, who was serving Zion Ev. 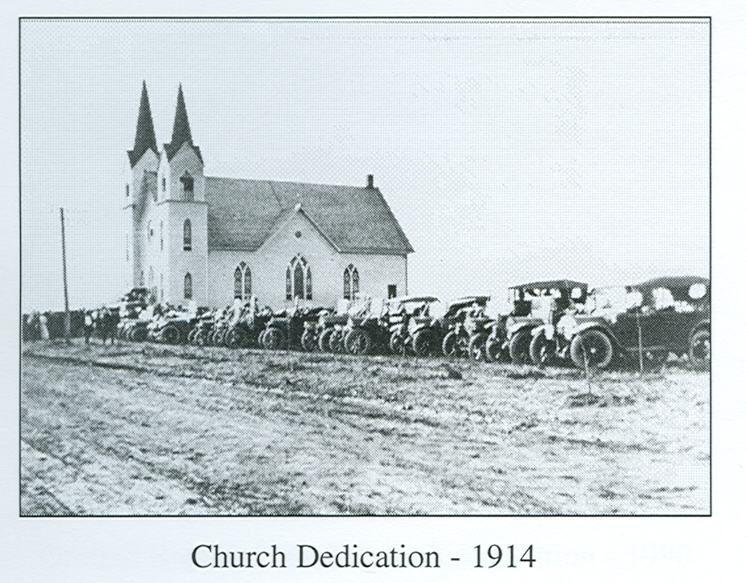 Lutheran Church of Mission, South Dakota, accepted our congregation's Call and was installed on February 9, 1930. On August 3 of that year our congregation celebrated its 50th anniversary with a day-long celebration which was attended by approximately 1,500 people. Three of the founders of the congregation were present to take part in this celebration: Emil Gottschlag, George Weichel, and August Steckelberg. Pastor Baumann served our congregation until May 17,1937. Again the first Call extended was accepted by Pastor Alvin Degner who was serving at White River, South Dakota. He was installed on July 25, 1937. The present parsonage was built in 1949 at a cost of $16,706. Pastor Degner delivered his farewell sermon on September 18, 1949, after accepting a Call from St. John's Lutheran Church of Town Trenton near Beaver Dam, Wisconsin. Once again the first Call extended was accepted by Pastor Frederick Weindorfof Goodhue, Minnesota, and he was installed on December 18, 1949. Pastor Weindorf became seriously ill in October of 1951. The Lord called him out of this life to life eternal on November 26, 1951. Pastor Hilbert Schaller was our next pastor, and he was installed on April 27, 1952. He served until November 20, 1955. Pastor Hugo Schnitker of Danube, Minnesota, was installed as our next pastor on April 15, 1956. He served until May of 1973 when he retired from the ministry. Our next pastor was Pastor Joel Frank who was serving a tri-parish in Montana. He was installed on June 3, 1973. After a new furnace was installed in church in 1975 the congregation began studying ways of repairing and protecting stained glass windows. The voters chose the Cathedral Glass Company to install plexiglass on all church windows at a cost of $9164. On January 7, 1979, we began broadcasting our Sunday morning worship services on Beatrice radio station KWBE-AM. Special services were held throughout 1980 to commemorate the 100th anniversary of our congregation. Christian education has always been an important part of our congregation's history. As early as 1883 it was decided to have about 60 days of school each year, especially for those who were to be confirmed. The first school structure was built in 1902. The 24 feet by 18 feet building was located north of the parsonage and south of the church with its entrance on the east side. During these early years the pastor served as teacher. In 1910 the school building was enlarged by 12 feet because enrollment in the 1909-1910 school year had increased to 41 students. Most of the pupils were 10-14 years old, and that year school began on November 1 and ended on June 13 with no classes during Lent. In July of 1915 it was decided to allow $200 "to pay for one helping teacher". Ema Lehninger filled this position, and for the next several years she helped her father in the school. John Selk, Jr., also assisted in the school around this time. The school was closed from 1919-1926 due to the war. In the summer of 1926 it was decided to re-open the school with Margaret Reuter as teacher. "The motion was made that as much German as possible should be learned." Philip Pohlman was called in 1941 as the first male teacher at a salary of $75 per month. Theodore Schmidt began his 14 years of teaching at our school with the 1944-1945 school year. After it became apparent that the old school building, which had served the congregation for 44 years, could no longer be repaired it was sold and moved off the property. Our present school building was dedicated on May 12, 1946, with the cost of the building and furnishings totaling about$16,368. In 1952 a house that would be used as a teacherage was purchased and moved north of the church on land donated by Henry Knoche. After Mr. Schmidt retired in 1958, John Isch was assigned to our school from Dr. Martin Luther College. In 1959 the voting members approved calling a second teacher. Robert Sperling served for one year, and in 1960 Marjorie Nommensen was assigned as teacher of the primary grades. In 1967 a third teacher was added to the faculty due to increasing enrollment. Our centennial year began with a special service of praise and thanksgiving on January 27, 1980, with Pastor Gerald Free, president of the Nebraska District, serving as guest preacher. After the service the church and school cornerstone boxes were opened and their contents examined. In preparation for the main centennial celebration to be held in June, new carpeting was installed in church, and the church was painted by the members. On June 8 Pastor Milton Weishahn, a son of the congregation, was the guest speaker for the 10 a.m. service. Pastor Donald Grummert, another son of the congregation, delivered the sermon for the 3 p.m. service; and Pastor Ernst Lehninger, son of former Pastor Max Lehninger, preached for the 7 p.m. service. 1,706 people attended the three services, and about 800 participated in the noon meal. Our celebration continued on September 14. Pastor G. B. Frank, father of our present pastor, delivered the sermon in the morning service, and Pastor Norman Berg, executive secretary of our synod's general board for home missions, was the guest speaker for the afternoon service. That evening a German service was held with former Pastor Hugo Schnitker serving as preacher. Our final centennial service was held in the afternoon on Thanksgiving Day, November 27. Pastor Carl Mischke, president of the Wisconsin Synod, was guest speaker. The March 15, 1981, edition of The Northwestern Lutheran contained an account of our congregation's history and centennial celebration. Individual offering envelopes were initiated in 1981, and a finance committee was appointed to count the offerings after each worship service. We began using the New International Version Bible translation in worship services on a limited basis. On May 16 a new cornerstone was set under the west bell tow''er of the church. That summer the school was remodeled by lowering the ceilings and installing new windows and carpeting for a total cost of $11,663. A cemetery storage building was constructed on land donated by Milton Hueske, and a new fence was installed on the north side of the cemetery. In 1982 the church and both houses were fully insulated. After several years of thorough study, our congregation adopted the use of the New International Version of the Bible on July 10, 1983. Later that summer the parsonage was repainted, and carpeting was installed in the second floor bedrooms and hallway. 1983 was also the first year that the Children's Christmas Eve Service was broadcast on the radio. In 1984 drainage tile was installed on the north and east sides of the church and on the west and north sides of the parsonage. The north basement wall of the parsonage was also replaced. The next year the school basement windows were replaced, and 45 new school desks were purchased. It was at this time that our congregation carried out a comprehensive self-study which helped us to determine how well we were meeting our goals. The full report was shared with the pastor/teacher/delegate conference. In 1986 the Stewardship Committee began annual presentations for all congregational members. These programs encouraged the proper use of time, talents, and treasures for the service of the Lord. That same year the teacherage, parsonage, church, and steeples were repainted, and the church sign was sandblasted and repaired. In 1987 an endowment fund was established for special gifts. The interest from this fund is to be used for special, non-budgetary items within the congregation. A committee was elected to manage this fund. Two new furnaces were installed in the school. After many years as the church janitor and the cleaning lady/flower arranger, Harry and Helen Schwab notified the congregation that they would like to retire from their positions. A special day was held in their honor to thank them for their faithful servIce. In 1988 an evangelism committee was established to help reach out to the unchurched in the area. Also that year air-conditioning was installed in the church, and the balcony was re-carpeted. In March of 1989 member mailboxes were installed in the front entrance. On April 30, 1989, we celebrated the 75th anniversary of the dedication of our church building with a special afternoon service. Pastor Donald Grummert was the guest preacher, and Pastor Milton Weishahn conducted the liturgy. The offering was designated for the Church Extension Fund. The tenth anniversary of our radio ministry was celebrated on Thanksgiving Day. On August 5, 1990, a ground-breaking ceremony was held for the construction of an addition to the church. This addition would include a handicapped accessible entrance and restrooms, offices for the pastor and secretary, a meeting room, an overflow seating area, a small kitchen, and storage areas. The total cost for the structure was $86, 251, and it was dedicated on April 28, 1991. In September of 1991 twenty-five new windows and frames were installed in the parsonage. 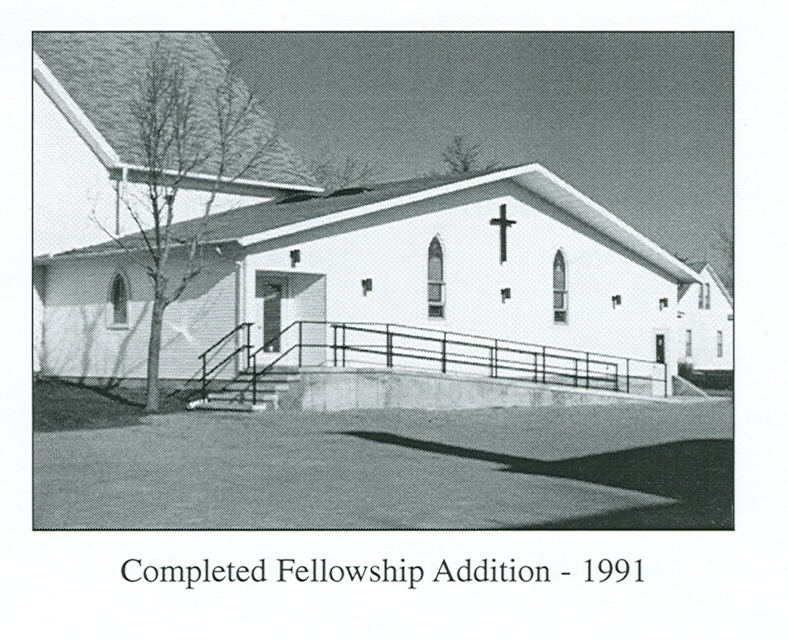 Vinyl siding was installed on the church in 1992 and on the parsonage the following year. The teacherage received new windows and vinyl siding in 1994, and the furnaces were replaced in both the teacherage and the parsonage. On September 11, 1994, we began using Christian Worship, the new WELS hymnal. Following a severe hail storm in 1995, the shingles were replaced on the roofs on the west side of church, the south and west sides of the school, the entire teacherage, and on the parsonage garage. In 1996 central air-conditioning was installed in the school, and sidewalks were added on the west and north sides of the church. 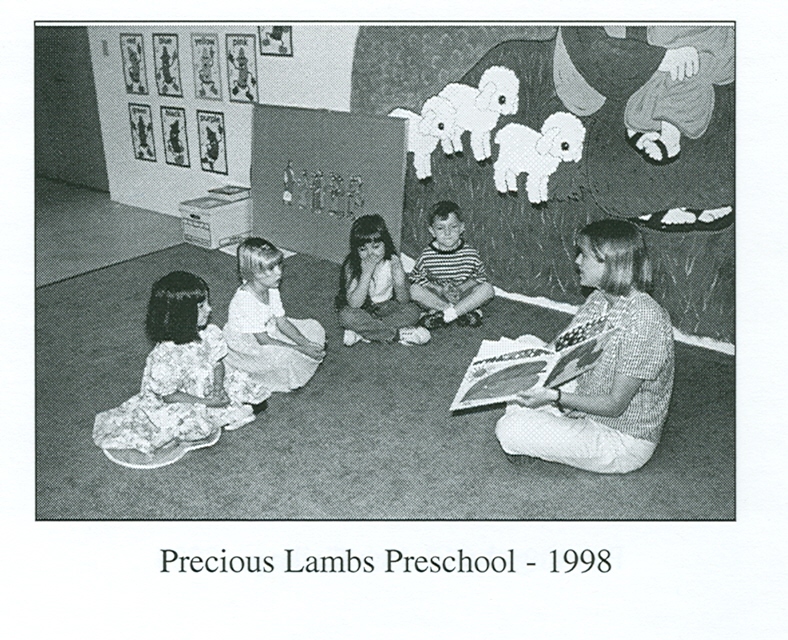 In 1998 it was decided to start a preschool in the basement of the church addition. Mrs. Beth Plitzuweit was called to be the first teacher. In the fall of 1998 a committee was formed to oversee the Thanksgiving, Christmas, and Easter decorating of the church. The following were asked to serve: Vickie Christ, Jill Frank, Judy Frank, Ann Freese, Sandy Hermesch, Donna Jung, Stephanie Scheele, and Susie Weichel. In March of 1999 a Redecorating Committee was appointed to formulate a design for redecorating the church in time for the 125th anniversary celebration in 2005. Those asked to serve were the trustees (Ryan Meyer, John Vossler, Marc Wasserman), Brian Burger, Judy Frank, Ann Freese, Leon Freese, Donna Jung, Karen Meyer, Calvin Weichel, Brian Weishahn, Alverta Wells, and Marvin Yost. Allen Schroeder was asked to serve as treasurer for this project. Mr. E. J. Potente, President of the Studios of Potente, Kenosha, WI, was hired to serve as consultant for the project. New white paraments and blue paraments for the Advent season were purchased with memorial money. Oil candles were added to the Advent wreath. The south half of the parsonage basement was renovated. The walls were reinforced, drainage tile and a sump pump were installed, and a new cement floor was poured. A new sound system for the church was installed. At the July 1999 voters meeting the anonymous donor was thanked. On May 21, 2000, a carillon system given in memory of Mr. and Mrs. Edwin Schroeder, Mr. and Mrs. Glenn Schroeder, Sr., Delma Zimmerman, and Orville Gronemeyer was dedicated. On August 12 and 13 the Loren Mueller estate sale was held with proceeds given to the church to establish a trust fund. The interest will be used for scholarships for St. Paul's students who wish to enter the preaching or teaching ministry. The estate has been loaned to called workers of St. Paul's to enable them to purchase their own home. An additional fund was established and is offered interest-free to assist in downpayment costs. On September 3,2001, as part of the Synod's Forward in Christ celebration, a confirmation reunion was held at the Plymouth Community Center for everyone who had been confirmed at our church before the year 1974. The reunion for those confirmed in 1974 and after was held on July 1, 2001, with Pastor Philip Zarling as guest speaker. Also that summer thirteen members of our Teens for Christ group went to Asheville, North Carolina, to teach Vacation Bible School. In the summer of 2002 seventeen teens traveled to Farmington, New Mexico, to teach VBS to the Navajo Indian children. Also that summer a new storage building was constructed on the parsonage property by church members at a cost of $9,667. That fall the heating and air-conditioning system was replaced at church. A new ceiling and improved lighting were installed in the church basement, and work was begun on the restoration of our stained glass windows by Palace Glass of Lincoln. In the summer of 2003 thirteen teens went to Casper, Wyoming, to teach Vacation Bible School at Lord of Lords Ev. Lutheran Church. In the fall of that year the restoration work on the rose stained glass window was completed, and the restrooms in the church basement were remodeled. The church, school, and both homes were connected to high-speed internet service. In 2004 a digital piano for the balcony was purchased with memorial money. In July twenty teens went to teach VBS at the Christ Lutheran Center in inner-city Denver. The final phase of the redecorating project, which included new wiring and lights, drywall, painting, and carpeting at a cost of about $89,000, was approved. Work began in early June under the direction of Marvin Yost who had been asked to serve as project coordinator. David and Linda Myers from New London, WI, were in charge of all the painting, and their daughter applied a marble-like finish to the pillars. A number of members removed the varnish and stain from the balcony pews and Donna Jung refinished them. It was also decided to remove the paneling from the front entrance and to install drywall. The sanctuary pews were removed and new carpeting was installed. Worship services were conducted at the Plymouth Auditorium beginning with the first Sunday in June. The project was completed by September 19 when our church was rededicated to the glory of God. Pew cushions were installed in 2005 in memory of Larry Milius by Ratigan/Schottler of Beatrice. In addition, we acknowledge with thanks the work completed by the following: Milius Hardware, Plymouth Electric, Jim's Carpeting, Daubendick Drywall, Malchow Construction, Filley Custom Powder Coating, Palace Glass, and Bedient Organ.